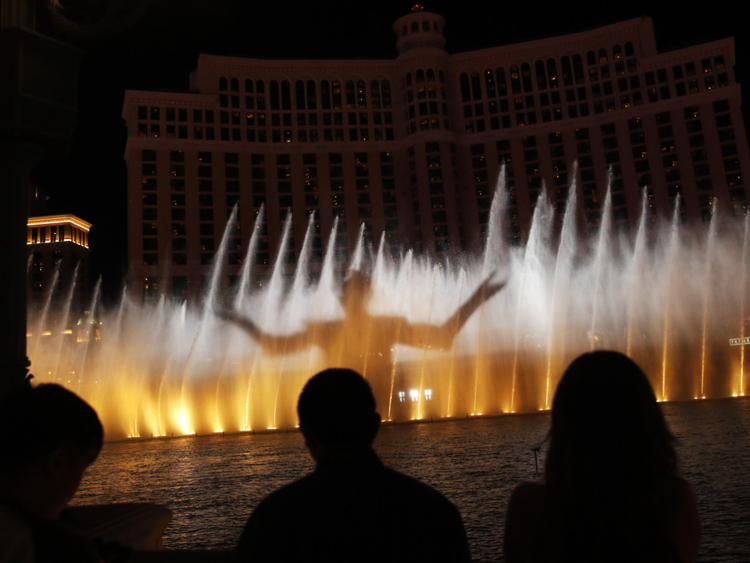 Fire-breathing dragons held court over the world-famous fountains at the Bellagio casino-resort on Sunday, as familiar elements from the TV phenomenon ‘Game of Thrones’ were projected on the rising water. The jets danced to a score incorporating the recognisable theme song before one of the colossal beasts lit up the lake along the Las Vegas Strip in a blaze of pyrotechnics. The three-minute spectacle that left a crowd of onlookers cheering debuted two weeks ahead of the scheduled premiere of the HBO fantasy series’ final season. The streaming water formed the show’s iconic throne and crown. A towering 244-metre wall of water emerged from the lake. The fountain show begins by dropping musical hints of the TV series, using Djawadi’s ‘Winter is Here’ from the seventh season. It comes to full force as the show’s recognisable ‘Main Titles’ theme song comes on. The spectacle ends as the shadow of the Night King appears one last time, and flames cover part of the roughly 3.6-hectare lake. The ‘Game of Thrones’ fountain show marks the first time the lake has been set ablaze, but artists and others have previously used the fountains for a variety of stunts. Billionaire Richard Branson rode a jet ski on the lake in 2010, and Drake performed one of his hits there during the 2017 Billboard Music Awards. The landmark at the luxury property owned by MGM Resorts International attracts millions of visitors every year. It has nightly shows with recorded music ranging from Andrea Bocelli and Sarah Brightman’s duet ‘Time to Say Goodbye’ to Sin City’s unofficial hymn ‘Viva Las Vegas’ sung by Elvis Presley.